Able to claw straight up a brick wall, squeeze through a pipe the width of a quarter, and gnaw through iron and concrete, rats are also revealed in this fascinating book to be incredibly intelligent and capable of compassion. Weaving together science, history, culture, and folklore, award-winning writer Albert Marrin offers a look at rats that goes from the curious to repulsive, horrifying to comic, fearsome to inspiring. Arresting black-and-white scratchboard illustrations with bold red accents add visual punch to this study of a creature that has annoyed, disgusted, nourished, and intrigued its human neighbors for centuries. 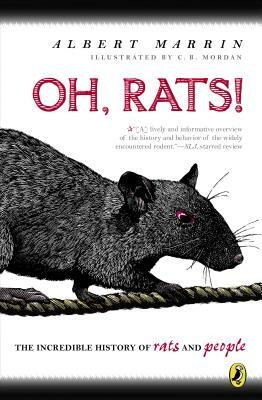 * "[A] lively and informative overview of the history and behavior of the widely encountered rodent.... It's a different sort of discussion... for this well-known historian and biographer and one that he has clearly enjoyed, as will a wide variety of nonfiction readers and animal fans. There's a bibliography of adult sources and children's nonfiction as well as a listing of literary works featuring rats." Albert Marrin is the author of many award-winning nonfiction books for young people and is the recipient of many honors, including the Washington Post Nonfiction Award for "outstanding lifetime contribution [that] has enriched the field of children's literature." C. B. Mordan has illustrated several children’s books, including Silent Movie by Avi and Guinea Pig Scientists by Mel Boring and Leslie Dendy. He lives in Kansas. "The book may be nonfiction, but it is also fine storytelling. C. B. Mordan's evocative black-and-white line drawings... show off the rat to its best advantage—in moments both wicked and benign. This is a fine marriage of narration and illustration; a very fine book, indeed." "The lore and science of rats receive an enthusiastic treatment... Well-designed sidebars present additional related factoids for the eager reader. End matter provides both the author's bibliography and a number of titles for further reading, both nonfiction and fiction. Even the most rat-o-phobic reader will emerge with a heightened appreciation for the hardy rodent."